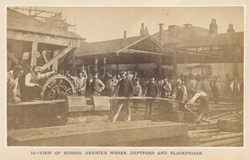 The George Rennie and Sons Works at Holland Street, Blackfriars, comprise a fine iron foundry and boiler yard, which produce some of the largest wrought-iron boilers for the navy. Iron ships for foreign governments and the Admiralty are built at Rennie's other large factory at Greenwich. George Rennie entered into partnership with his younger brother John after the death of their father in 1821, developing many of the vast undertakings originated by the elder Rennie. George developed the screw-propellar and his firm built the engines for the Archimedes. In 1840 his firm constructed the Dwarf for the Admiralty, the first vessel in the British Navy propelled by a screw.